The predecessor to the Nicholas, Fayette & Greenbrier Railway (NF&G) was the 14.2-mile Chesapeake & Ohio Railroad (C&O) Gauley Branch, constructed in 1893-94 from Gauley Junction north along the Gauley River and Twentymile Creek to Greendale to serve a coal mine. 8 The Flynn Lumber Company was established at Swiss in 1905, several miles east of Twentymile’s confluence with the Gauley, and was served by the C&O. In 1906, the Meadow River Lumber Company was founded in what became Rainelle, and eventually became the largest hardwood sawmill in the world. 8 The Sewell Valley Railroad was built between June 1908 and September 1, 1910, from to the C&O mainline at Meadow Creek, a distance of 21 miles, to serve the new mill. 9 The 19-mile Loop & Lookout Railroad was constructed by Meadow River from Rainelle northwest to Nallen. The 12-mile section from Dyer and Burdetts Creek was built from December 1908 to 1911, and the 7-mile segment from Burdetts Creek to Nallen was built from October 1915 to March 6, 1916. In 1917, the Sewell Valley and Loop & Lookout were transferred by lease to the Sewell Valley & Ohio Railway (SV&OR). 7 In 1929, the NF&G was formed, and the SV&OR was conveyed by deed to the newly created paper company in 1931. The NF&G did not own any locomotive or revenue cars but did own some non-revenue equipment, such as an NF&G wrecker. 1 A coal assembly yard was located at Rainelle. From the town, the C&O took coal south towards the mainline at Meadow Creek, while the NF&G ran west from Rainelle along the Meadow and Gauley rivers to Swiss, where it connected with the New York Central Railroad (NYC). In 1973, the Chessie System was formed from the merger of the C&O, the Baltimore & Ohio Railroad, and the Western Maryland Railroad, which later merged with the Seaboard Coast Line to become CSX Transportation (CSX) in 1987. 7 The NYC merged with the Pennsylvania Railroad, which became Penn Central in 1967 and eventually Conrail. In 1973 and early 1974, the three-mile Glade Creek branch was added at Russ Station, four miles west of Nallen. 14 The branch served Pittston Coal Company’s deep mine, a deep mine operation that produced over one million tons of coal annually. It handled about 80 cars per day with two crews. On January 16, 1996, an application to dissolve the 143-mile NF&G was filed by Conrail and CSX to the Surface Transportation Board. 6 Under the request, Conrail would acquire the NF&G from Swiss to Peters Junction, a distance of eight miles, while CSX would acquire the NF&G from Peters Junction east to Meadow Creek. The branch lines between Rainelle Junction and Raders Run, and Rupert Junction and Clearco, and C&E Junction and Brush Junction would operate under the CSX Sewell Valley Subdivision. The last train operated over CSX’s Sewell Valley Subdivision from Peters Junction and Russ Station in July after the Pittston mine closed. 13 Subsequently, CSX filed for abandonment of the route on January 30, 1997. In 2006, a coal mine along Glade Creek and on April 8, 2008, CSX filed a notice to abandon a section of its Sewell Subdivision from a point near Rainelle through Babcock and Nallen to Russ Station. 7 Both requests were approved. 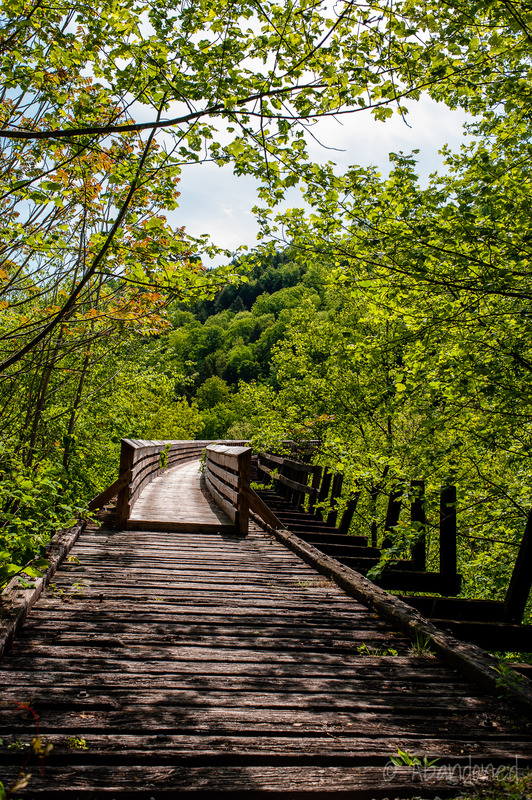 In July 2008, commissioners from Greenbrier and Fayette counties requested the assistance of the National Park Service (NPS) Rivers, Trails & Conservation Assistance Program for the proposed Meadow River Rail Trail through the Gauley River National Recreation Area. 2 The 16.7-mile trail, along the former NF&G right-of-way, would connect Peters Junction to Russellville with a long-term goal of extending the trail to Rainelle and possibly the Greenbrier River Trail, the former C&O Greenbrier Branch. 2 It would include the Carnifex and Koontz tunnels and two bridges over the Meadow River. 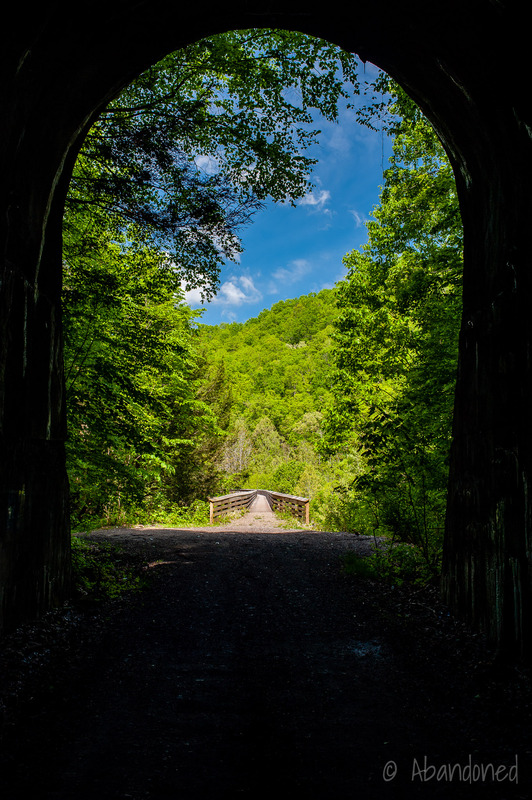 The counties committed $66,000 towards the purchase of the corridor, and the trail was approved of a $100,000 West Virginia Division of Highways (WVDOH) Recreational Trail Grant. 2 An independent appraisal performed by an NPS Challenge Cost-Share grant pegged the cost of the property at $92,000. In 2012, the counties purchased the NF&G rail bed from CSX with the assistance of Transportation Enhancement Grant money, the WVDOH, and the NPS. 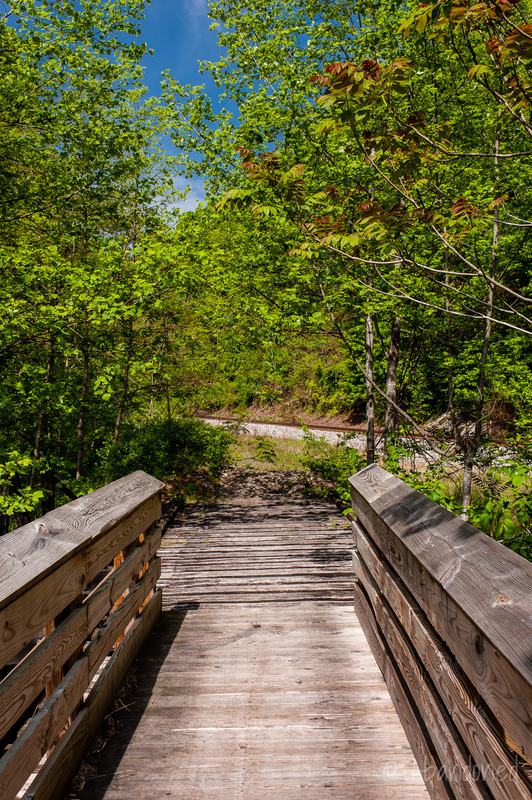 4 11 Over $435,000 was secured for the project, with an additional $300,000 in grant applications under review, including $50,000 from the Recreational Trails Program and $250,000 from WVDOH’s SAFETEA-21 program. In October, Xinergy Corporation completed acquisition over 10,000 acres of coal seams along the Meadow River in Fayette, Nicholas, and Greenbrier counties, along with the former Songer Whitewater Rafting site along US Route 19 in Fayette County. 3 The secretive project, pegged between $10 to $12 million, included 425 acres of surface and mineral property along Glade and Little Glade Creek in Fayette County, 10,899 acres of mineral rights along the Meadow River Fayette, Nicholas and Greenbrier counties, and 104 acres of surface and mineral rights in Fayette County. The land was acquired from Heartwood Forestland Fund IV through a subsidiary, Whitewater Resources. 3 A mid-volume mine was proposed for construction by 2015. An employee Xinergy approached WVDOH and expressed interest in moving coal out of a newly acquired surface mine northwest of Lookout via the NF&G, which would impact the development of the Meadow River Rail Trail. 4 The mine was ultimately never developed, owing to a long-term slump in coal production. Despite the setback, an additional 6.2 miles of the NF&G were acquired to bring the Meadow River Rail Trail into Rainelle. 16 Floodwaters in June 2016 damaged the two partially complete bridge decks for the Meadow River Rail Trail over the Meadow River. 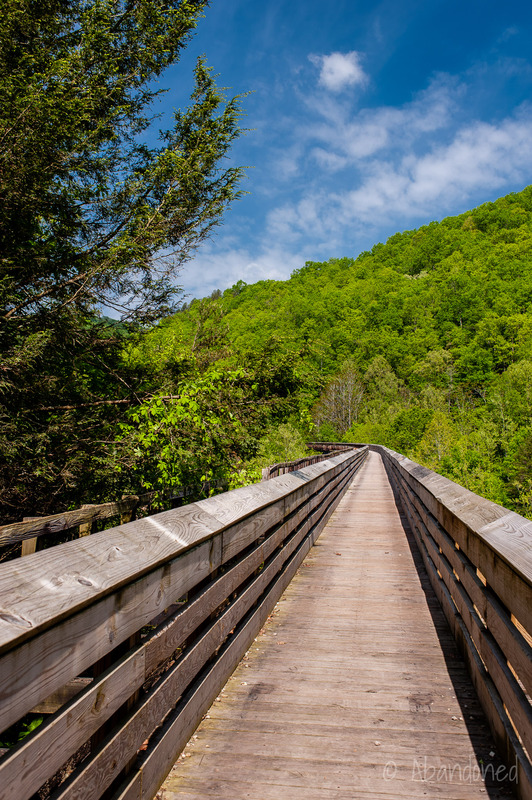 In the spring of 2018, $1 million in Federal Emergency Management Agency (FEMA) funds were secured for the installation of a new bridge for the trail in Fayette County. 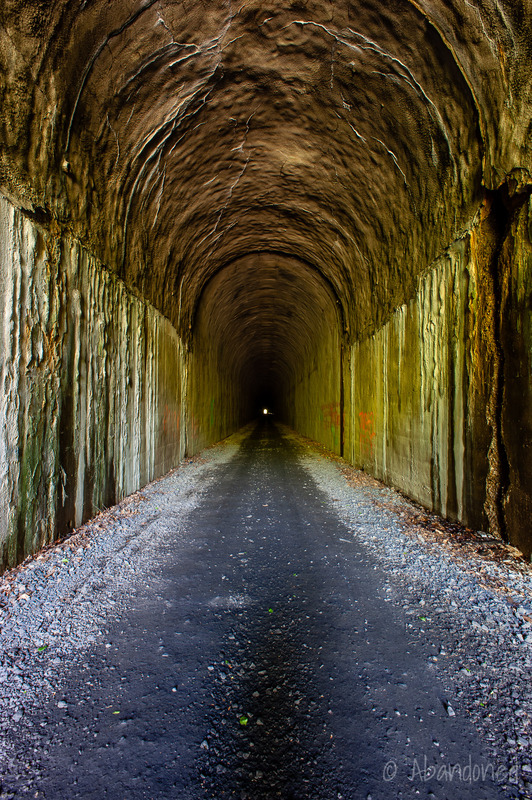 16 Gravel surfacing began shortly after in Greenbrier County, and a $100,000 recreation trail grant was secured to surface the line into Rainelle. The 22.9 mile Meadow River Rail Trail could be open to recreational use by late 2018. The Koontz Bridge was partially renovated for use as a trail. Huddleston, Eugene, John Joseph, and Everett Young. “The New River Field.” Chesapeake & Ohio, Coal, and Color. Marceline, Mo. : Walsworth, 1997. 17-19. Print. “Work progressing on rail-trail project.” Fayette Tribune [Oak Hill] 5 Oct. 2009: n. pag. Web. 3 June 2013. Article. Moore, C.V. “Coal company buys over 10,000 acres.” Fayette Tribune [Oak Hill] 6 May 2013: n. pag. Web. 3 June 2013. Article. Moore, C.V. “Commissions moving ahead with rail-trail” Fayette Tribune [Oak Hill] 1 Oct. 2012: n. pag. Web. 3 June 2013. Article. Cameraman. “CSX/Nicholas, Fayette and G-brier info.” Trainorders.com. N.p., 6 Nov. 2000. Web. 3 June 2013. Article. Office of the Federal Register, National Archives and Records Administration. “61 FR 6059 – CONSOLIDATED RAIL CORPORATION AND CSX TRANSPORTATION, INC. ACQUISITION AND OPERATIONNICHOLAS, FAYETTE AND GREENBRIER RAILROAD COMPANY.” Federal Register 61.32 (1996): 6059-6060. U.S. Government Printing Office. Web. 3 June 2013. Article. “CSX TRANSPORTATION, INC.–ABANDONMENT EXEMPTION–IN GREENBRIER AND FAYETTE COUNTIES, WV.” Surface Transportation Board. N.p., 8 Apr. 2008. Web. 3 June 2013. Article. “A Timeline of Gauley River History.” Gauley River National Recreation Area. National Park Service, 3 June 2013. Web. 4 June 2013. Article. Strouse, L.K. Interstate Commerce Commission Reports: Reports and Decisions of the Interstate Commerce Commission of the United States. Vol. 106. N.p. : United States. Interstate Commerce Commission, 1926. Print. Interstate Commerce Commission Reports: Decisions of the Interstate Commerce Commission of the United States. Vol. 28. N.p. : United States. Interstate Commerce Commission, 1929. Print. Steelhammer, Rick. “Meadow River Rail-Trail takes shape.” Charleston Gazette 19 Nov. 2011. Web. 4 June 2013. Article. Stahlgren, Lori, et al. “Koontz Bridge and Tunnel.” HISTORICAL ARCHAEOLOGICALSURVEY: NEW RIVER GORGENATIONAL RIVER AND GAULEY RIVERNATIONAL RECREATION AREA. N.p. : Kentucky Archaeological Survey, 2007. 314-19. Article. 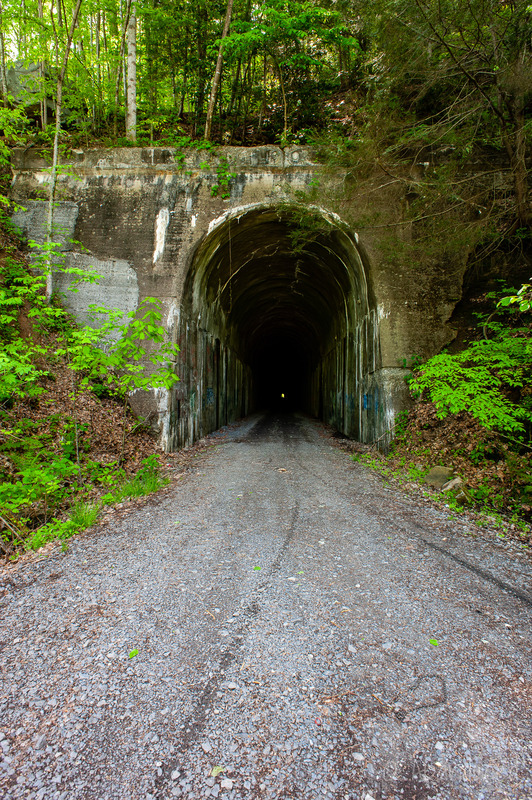 “CSX TRANSPORTATION INC.–ABANDONMENT EXEMPTION–IN FAYETTE AND NICHOLAS COUNTIES, WV.” Surface Transportation Board. N.p., 30 Jan. 1997. Web. 4 June 2013. Article. Bagdon, Phil. “Caboose Notes.” Chesapeake & Ohio Historical Magazine Feb. 1974: 8. Print. Joseph, John. “The Nicholas, Fayette & Greenbrier.” Chesapeake & Ohio Historical Magazine Aug. 1990: 3-19. Print. Combs, Matt. “Meadow River Rail Trail back on track.” Register-Herald [Beckley], 26 Feb. 2018. 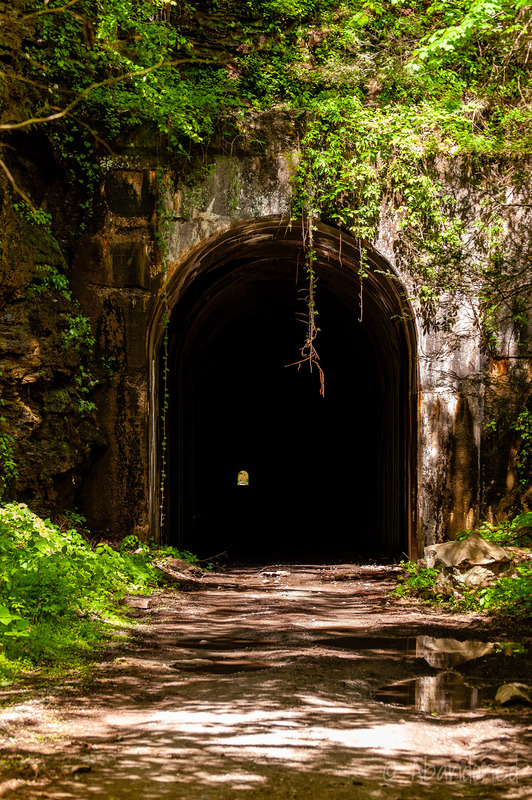 I lived in this area many years ago and my husband explored this tunnel as a boy scout in the 1930’s. Any maps, pictures and articles will be truly appreciated. 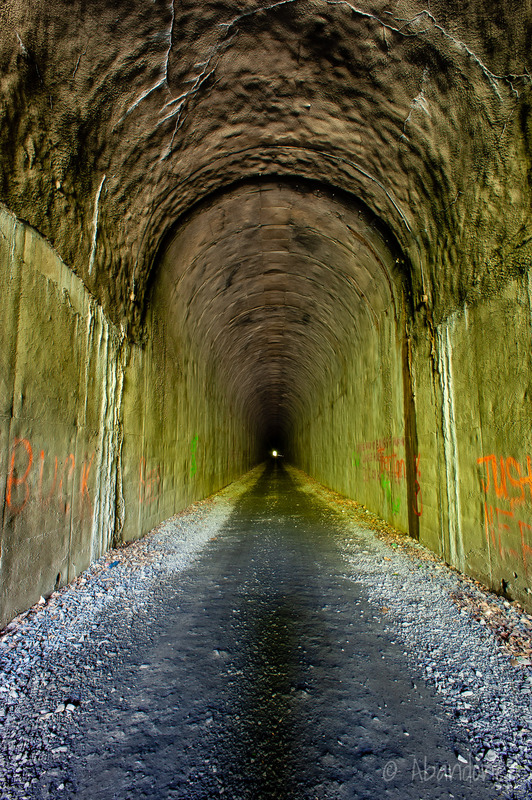 I especially would like a photo of the koontz tunnel. Many memories here. THANK YOU!